My handmade Boomarks are pictures of double sided animals, typically facing upward and sticking out their tail, that got laminated and cut properly (digital/prints). That way their tails will stick out of your book, so that you can remember where you last stopped reading. I created them in 2012. What kind of Bookmarks are there? You can buy them at conventions from me, or you can send me an E-Mail and order them this way and I will ship them. I have a dog / maned wolf / hyena character? Can you make those? etc. Depending on how much work the outline changes are, the price may be a little higher. 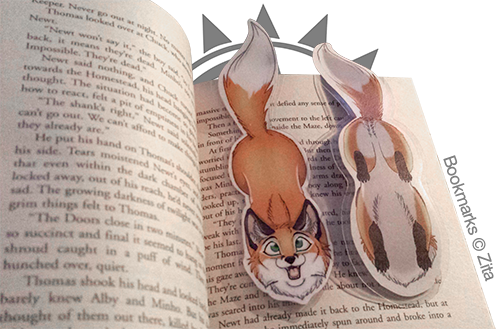 Someone has a cool custom Bookmark, can I have it too with my character? commission the same pose as a custom mark (it will be new drawn for you). Do you have any "secret" Bookmarks you didn't announce in public? No. All Bookmarks I have available are listed on this website. If you have seen a different/new Mark, it was probably a Custom pose of somebody. Are the Bookmarks water proof? too wet, since a chance of damage always remains. No worries, I never delete any art files. For a little fee covering material costs and shipping I can send you a replacement.